Adams Keegan, a national managed HR, payroll and benefits provider, today announced it has expanded its presence in Nashville by opening a new office near Vanderbilt University at 210 25th Avenue North. Business executives, HR professionals and organizational leaders constantly seek the best ways to retain employees. That’s because it is increasingly more important to maintain established, productive and cost-efficient teams in a business climate with premium costs for good talent. 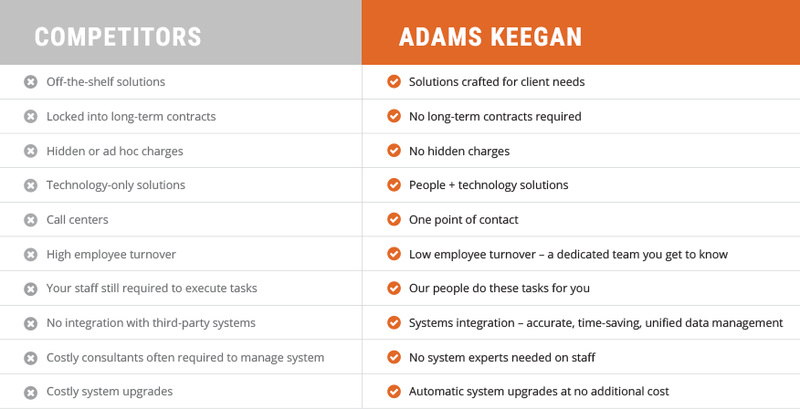 Adams Keegan, a national managed HR, payroll and benefits provider, today announced its expansion into Texas, extending its footprint throughout Dallas-Fort Worth, Austin and Houston. This expansion comes amid a period of continuous, nationwide growth for the company and will be led by Joe Ruzicka, Regional Director of Sales. Ruzicka reports to Trevor Benitone, Vice President of Business Development. Lockhart leads the Recruiting Services team for Adams Keegan, where she helps external clients hire talent that is the right fit for their company in skills and culture, while also sourcing employees for internal hires. From companies that have been in business for years to early-stage companies and startups, all organizations want to recruit the best talent.